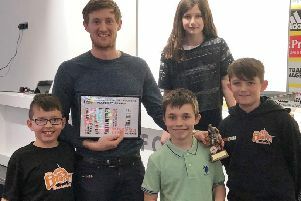 The Wren Cup and Wren Plate champions have been crowned as the Hemel Hempstead Table Tennis League season draws to a close. In the Cup, Adeyfield I retained their trophy with a 49-point victory over St Michaels, while the Plate went to Division Three side Adeyfield C after their exciting 22-point triumph against Division One outfit Crown & Sceptre A. Back in league action, Division One leaders Crown & Sceptre I had a Gary Keers treble to thank for a close 6-4 victory to finish off their season in winning style. However, second-placed Adeyfield I beat Crown & Sceptre A 8-2 to keep the title race open thanks to a Mike Boardman maximum, while St Michaels had a comfortable 10-0 win over Northchurch I. Elsewhere, Flamstead A wrapped up the Division Two title with a 9-1 victory versus KLCC I, with Jack Reyland and Allen Dennis completing hat-tricks. Crown & Sceptre B could only draw 5-5 with KLCC I but it was enough to confirm runners-up spot, with Ian Cooper leading the way. The battle between McAlpine I and their A team finished with the firsts winning 6-4 thanks to a Trevor Leverno maximum. Division Three champions St Georges I finished their season unbeaten with a 10-0 victory over Crown & Sceptre D, with Jackie Channell, John Figg and Chris Ward doing the damage. Adeyfield C confirmed second place with a 10-0 whitewash over Northchurch A, with Bob Saupan, Roger Dean and Mariusz Puczynski all completing trebles. Mark Chiles led the way for Highfield in an 8-2 win against St Georges A, while KLCC A had Rod Marshment and Pete Watts to thank for an 8-2 victory over Crown & Sceptre D.